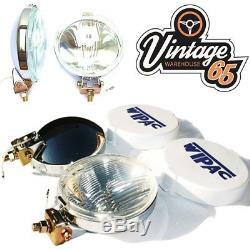 Vintage Warehouse 65 Genuine Wipac Accessory Lighting. 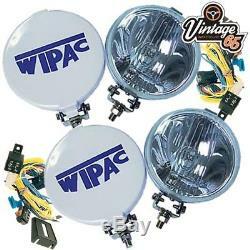 A Set of 4 Genuine Wipac Chrome Accessory Spot & Fog Lamps. Complete ready to go with 12v 55 halogen bulbs. Includes 2 custom wiring kits with relays, switches, fuses and all the wiring required to safely wire in your lamps independently. Metal housing with polished chrome finish. Come with removable Rally Style Wipac Logo Plastic Covers. 135mm Diameter x 50mm Deep. The lamps require a 10mm mounting hole to bolt through. Can be retro fitted to many different classic cars such as; Morris Mini Austin Jaguar Hillman Triumph Ford Allard Armstrong Siddeley Bristol Daimler Jenson Jowett Bently Ford Midget Morris Oxford & Cowley Rover Rolls Royce RR Singer Triumph Standard Sprite Vauxhall Wolseley etc. The item "Classic Car Austin MG Triumph Wipac Chrome Driving Spot & Fog Lamps + Wiring Kit" is in sale since Wednesday, November 7, 2018. 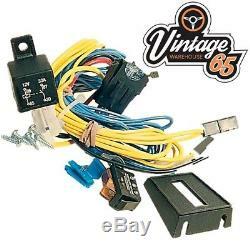 This item is in the category "Vehicle Parts & Accessories\Car Parts\External Lights & Indicators\Fog Light Assemblies". The seller is "vintagewarehouse65uk" and is located in Bromsgrove. This item can be shipped to all countries in Europe, all countries in continental Asia, United States, Canada, Australia, Brazil, New Zealand, Mexico, South africa, Chile.